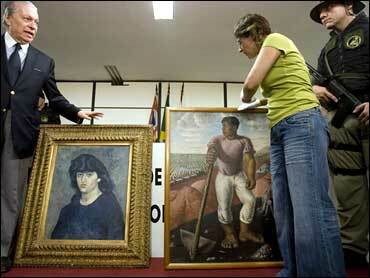 Police recovered paintings by Pablo Picasso and Candido Portinari worth millions of dollars stolen last month from Brazil's leading modern art museum and have two suspects in custody, officials said Tuesday. The paintings were found undamaged and covered in plastic, leaning against a wall in a house on the outskirts of Sao Paulo after one of the suspects led authorities to the home, said Mauricio Lemos Freire, the city's chief police inspector. At a press conference late Tuesday, police exhibited the paintings - Picasso's "Portrait of Suzanne Bloch" and Portinari's "O Lavrador de Cafe" - while two guards armed with assault rifles, pistols and bulletproof vests stood by. Portinari is one of Brazil's most influential artists. Julio Neves, president of the Sao Paulo Museum of Art, said the paintings are "in absolutely perfect condition," and will be put on exhibition on Friday - the date of the museum's reopening. He said the paintings will hang in the same spots as before their theft on Dec. 20 by robbers armed only with a crowbar and a car jack. The two suspects in custody - Francisco Laerton Lopes de Lima and Robson de Jesus Jordao - have criminal records and took part in the theft at the Sao Paulo Museum of Art, Freire said. One of the men was arrested on Dec. 27 and the other on Tuesday.